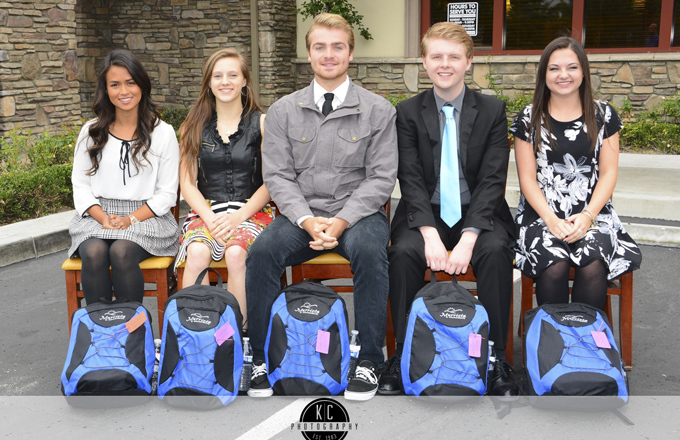 From left: Vista Murrieta High School senior Jazriel Ortega; Springs Charter School senior Courtney Gravett; Murrieta Valley High School senior Hudson Rawlings; Calvary Murrieta Christian High School senior Ricky Franklin; Murrieta Mesa High School senior Mollie Cox. Vista Murrieta High School senior Jazriel Ortega has been in swim, water polo and choir all four years of high school. She is a highly intelligent, humble and kind student who has shown persistence and determination. In addition to singing in the chamber and concert choirs, she has been committed to academic excellence, maintaining a 4.3 GPA while taking 11 AP and dual enrollment classes and a summer school class in multivariable calculus at Stanford. Ortega said she has learned the importance of time management, working hard and having a strong work ethic. She has a positive can-do attitude and she is able to adapt to any situation she finds herself in, qualities that are sure to bring her success in college and her future career. Ortega has been accepted to Penn State and Cornell University and she plans to major in chemical engineering. Springs Charter School senior Courtney Gravett is in an independent study high school program and she has already earned 30 units of college credit at Mt. San Jacinto Community College. Gravett excels in math and science.She has been in All-Star Cheer for four years and she has competed in cheer at the national level. Gravett has served an internship at All-Star Cheer, where she coached cheer classes. During a summer intensive course at San Francisco Art Institute last year, Gravett discovered her passion and talent for photography. She has been accepted to San Francisco Art Institute, Brooks Institute and the School of Chicago Art Institute. The future is bright for this independent young lady, who looks forward to showing the world the beauty she finds through her camera lens. Murrieta Valley High School senior Hudson Rawlings entered his senior year with an impressive resume. He has played water polo for Team USA and he is a two-time All-American who played on the national team in Europe and South America. He is Southwestern League MVP, CIF-SS Div. 3 Player of the Year and the 2015 HSGametime Boys’ Water Polo Player of the Year. Rawlings was also his school’s ambassador on a trip to China. In spite of his success, Rawlings is a humble leader who serves as Senior Class President, helps out with community activities and coaches 10-year old boys. Rawlings puts forth tremendous effort and he does the hard work needed to succeed in class and all-around. He has a 4.7 GPA and he has completed several AP and International Baccalaureate classes. Rawlings has a scholarship to play water polo at Brown University, where he plans to major in business and economics. Calvary Murrieta Christian High School senior Ricky Franklin has been involved in art, music and theatre. A talented musician, Franklin plays the tuba, trombone and electric bass and he plays in his school’s jazz band. He has starred in school plays in diverse roles such as Charlie Brown to the lead in "Wait Until Dark" and he pours himself into each character. Franklin is known for being kind, compassionate, thoughtful and extremely creative. He is passionate about injustices in the world and he is involved in his school’s anti human-trafficking club. Franklin said he has learned that you can’t judge others because not everyone has had the same advantages in life he has received. He plans to attend Point Loma Nazarene University, where he will major in graphic design. Murrieta Mesa High School senior Mollie Cox has been a four-year member of her school’s student activities leadership program. She currently services as Commissioner of Publicity, she is in California Scholarship Federation, has been involved in cheer, the dance team, American Sign Language Club and the Pink Ribbon Club. Cox has coached cheer at All-Star Cheer for two years and she currently teaches gymnastics at Cartwheels. She has served 450 community services hours, mostly at her church. She is also involved with Dress of Hope with students who make dresses out of pillowcases and ship them to Africa. Cox said she has learned that no matter how busy and stressful life gets, it’s important to keep a positive attitude, put your best foot forward and not give up. She plans to go to Grand Canyon University to get a Bachelor of Science degree and become a nurse. After she works as a nurse for a few years, Cox plans to pursue her Master’s degree and become a certified nurse anesthetist. If you wish to learn more about the Student of the Month Program, please contact Sally A. Myers, Founder, at 951-506-8024. If you are interested in sponsoring the Student of the Month program, please contact Margaret D. Jones, Chair of the Murrieta Student of the Month Program at (951) 677-4856.